Political analysts say that state Sen. Leticia Van de Putte's prospects in her lieutenant governor race rely largely on a significant turnout from Hispanic voters in the general election. Could her last name impact her ability to motivate some of those voters? With the chances of Texas Democrats winning a statewide office in November hinging largely on a higher turnout among Hispanics, the only Hispanic on their statewide ticket goes by the last name Van de Putte. On the campaign trail, it is easy to see state Sen. Leticia Van de Putte embrace her Hispanic heritage. The lieutenant governor candidate — known in her San Antonio district as the pharmacist from the “barrio” — peppers her speeches with Spanish, ending many with a “muchísimas gracias” instead of a “thank you so much.” She has hosted a “pachanga,” or a Mexican party, in the Rio Grande Valley and regularly participates in interviews on the Spanish-language channel Univision. But she is still working to introduce herself to most of the state. As she tries to build name identification statewide, her last name does not immediately resonate with many in the Hispanic community she hopes to draw to the polls in big numbers. And political observers say that for Van de Putte to stand a chance of defeating her Republican opponent, state Sen. Dan Patrick of Houston, motivating those Hispanic voters is a must. Despite her outreach efforts, Van de Putte has another challenge in making herself know to Hispanic voters who may not be tuned into politics until just before Election Day. Some point to the March Democratic primary as evidence of the bump a Hispanic name can provide. State Sen. Wendy Davis of Fort Worth handily won the Democratic nomination for governor. But she lost several border counties with large Hispanic populations to Ray Madrigal, a municipal court judge from Corpus Christi who reported no money raised or spent on his campaign. Republicans said Davis lost the counties because of her support for abortion rights, but other analysts argued it was her low name identification in the region and being pitted against a candidate with a Hispanic surname. Instead Van de Putte must rely on more overt aspects of her campaign meant to serve as cues for voters about her heritage, Manzano said. Van de Putte’s campaign has recently promoted a “Viva La Leti” slogan, pushing it on social media and using it as a marquee for events. In a recent interview, Van de Putte said it would be disrespectful to voters and Hispanics if she played up her heritage for political gain, and that she only intends to be genuine about her background despite perceptions of it being used as an outreach strategy. The Hispanic vote is one both Democrats and Republicans have turned more attention to during this election cycle. Although less than a third of eligible voters in Texas are Hispanic, the Hispanic population is expected to become a plurality by 2020 as the state’s demographics continue to shift. In 2012, only 39 percent of Hispanics in Texas eligible to vote cast a ballot in the presidential election. In that same election, 61 percent of eligible white Texans voted. Mobilizing that voting bloc has become part of the Democrats’ strategy to make gains in the state. And Republicans, both at the local and national levels, have started their own outreach efforts. Van de Putte’s supporters hope she can draw a clear contrast with Patrick, who has attracted headlines — and criticism — over some of his comments on illegal immigration. During his primary campaign, Patrick described the influx of undocumented immigrants to Texas as an “illegal invasion.” In his runoff victory speech last month, Patrick struck a more conciliatory tone, saying he would work to make inroads with the state’s Hispanic community. “Before you can get someone’s vote, you have to respect them enough to go talk with them and explain who you are,” Patrick said in the speech. The Patrick campaign did not respond to a request for comment. Guadalupe Correa-Cabrera, a political science professor at the University of Texas at Brownsville, said voters identify with a candidate who speaks their language and understands their traditions. But she argued that Van de Putte’s campaign against Patrick could be more successful among Hispanic voters if she “enriched” her campaign with specific policy proposals to help the Hispanic community. Van de Putte has sought to differentiate herself from Patrick on crucial issues among Hispanics, including immigration and health care. Patrick opposes a pathway to citizenship for undocumented immigrants, and he is against allowing undocumented students to pay in-state tuition rates to attend public universities. Van de Putte has been a vocal supporter of in-state tuition and has talked about the need for immigration reform. Patrick staunchly opposes the Affordable Care Act; Van de Putte has endorsed it. 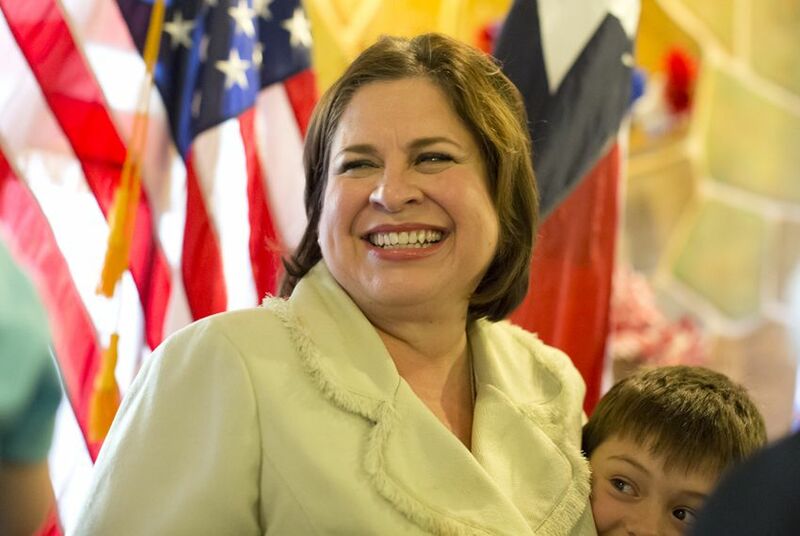 While her understanding and connection with Hispanic voters could be beneficial, Lionel Sosa, a Republican media consultant who previously worked for George W. Bush, said Van de Putte’s biggest challenge would be to raise enough money to spread her message. Van de Putte agreed and emphasized that she is running to create a better future for all Texans. But she added that her Hispanic heritage — like her professional career in health care and her role as a mother —play into who she is as a leader and the issues she is concerned about. While it may be odd for individuals outside of South Texas to realize how much of her personality and daily life are a product of her bicultural upbringing, it all falls into the fact that voters in Texas are not accustomed to seeing Hispanic females run for high office.